Clay Jensen arrives home from school to find a mysterious package waiting for him on his doorstep. Upon opening the package he discovers a shoebox filled with tapes with instructions from Hannah Baker, the enigmatic girl from school who only two weeks earlier committed suicide. Confused and intrigued Clay plays the first tape – where Hannah reveals that there are thirteen reasons why she killed herself. And that Clay is one of them. After finishing Jay Asher’s Thirteen Reasons Why I wasn’t really sure what to make of it; I had to take some time to evaluate and digest what I’d just read. If I’m being perfectly honest I wasn’t sure if I actually liked the book as a whole. I knew I liked aspects of it, I knew I really liked the overall concept but I needed time to decide if the book is actually as profound as I think it aims to be. Suicide is a touchy subject no matter the medium, teen suicide even more so with its prevalence as of late in the media. One of the things that TRW does best is remain neutral about the act itself. In no way does this story glorify suicide, or suggests Hannah’s actions were the right choice. Instead it aims to simply examine what lead to such a drastic decision. And questions who is responsible? My main issue with the book is Hanna. I can’t help but feel a little bit of the incredulity and impatience I usually reserve for Holden Caulfield alone towards her. As Clay plays each tape, agonizing over the revelations and truths Hannah confesses I found myself thinking about the superficiality of some of these problems. Perhaps this is a sign that I’ve really left my adolescence behind once and for all, maybe I’ve just forgotten what it’s like to be a teenager. But I don’t think that’s true, because the saddest truth you discover as an adult is that high school is really just a precursor for the incredible follies of the workplace, the grocery store, the highway – life in general. The mean girls from high school grow up to be the mean girls at work and the circle of life continues. This isn’t to diminish the way Hannah feels, but as I read I couldn’t help but feel in the end she lacked the foresight necessary to move forward. Instead of hoping that Mr. Porter would magically guess at her problem and then make everything better it would have been smarter (and braver) if she’d just told him what was wrong. She trusted him enough to go to him. The fact is, by the time she went to Mr. Porter, she’d already made up her mind. She’d already decided there was no other way to solve the problem. The novels main concept – Hannah’s 13 reasons, is incredibly clever (and a little morbid.) The tapes and Hannah’s hit list of those responsible reminded me of A Christmas Carol and Scrooges’ ghostly visits, with Hannah as Marley’s ghost. (Because good tidings she does not bring.) Asher manages to give Hannah the perfect amount of vulnerability and rebellion, making it hard to dislike her (regardless of how perfunctory some of her reasons may be.) And ultimately making you, as the reader wonder why these kids treated her so badly. If you take Hannha’s words at face value than this is a story filled with unlikeable characters – but it’s important to recognize we only ever learn about them through the eyes of a troubled, and embittered girl. Which begs the question, are they really as terrible as Hannah says? Are there maybe extenuating circumstances in their lives that have caused them to make certain choices that in turn affected her? Everything in life is cause and affect right? If this is true than really the story is one-sided and definitely skewed so that the reader agrees with Hannah, so that the reader can empathize with her pain. Or at least that’s how it appears initially, however as the story progresses it’s made more evident that even though Hannah is narrating the major events this story is all about Clay. It’s about the guy he was to her, and the guy he could be to someone else. Clay’s tape acts in a way as Hannah’s redemption – she knows that the tapes -calling out these kids who have wronged her- is warped and cruel. She’s perfectly aware she’s manipulating them from the grave. But, she also knows that in not opening up to Clay she wronged him (in a sense.) She pushed him away; she was so broken that she couldn’t give him a chance, even though she knew he wasn’t like the rest. And despite Clay’s own musings on being afraid to get to know Hannah for fear of what others would say it’s obvious he’s enough of his own person that he would have overcome that feeling, because to him she was worth it. By the end of the book it’s not Hannah you feel for but Clay – Clay who, in having to listen to the tapes has to live with the knowledge of his peers’ cruelty, and the pain the girl he loved lived with. That seems like a harsh and unfair burden for a guy everyone says is genuine and nice. I won’t go ahead and spoil the ending but I will say this, it was my favourite part. Instead of ending on an angst ridden, “why me?” note, Asher actually sets in motion a new wrong to right and he does so in a way that leaves you feeling like the emotional roller-coaster you just road was worth it. That’s a pretty strong way to end. 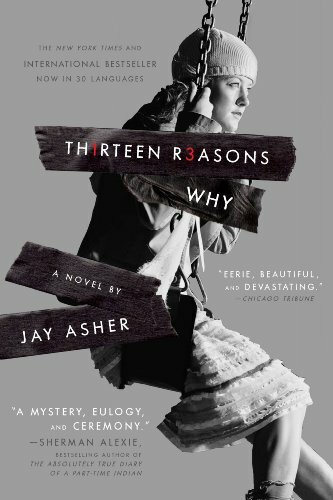 Overall I did enjoy Thirteen Reasons Why . After taking the time to digest the story and pick apart Hannah’s reasons and Clay’s reactions I was able to appreciate how the events played out. And though I still stand by my statement that some of Hannah’s reasons were relatively superficial, I do believe that the overall point of the story was really well executed. Also once you recognize that this is really and truly Clay’s story it becomes so much easier to appreciate the secrets and lies that are being revealed. I do wish Clay had been a little more developed – that his thoughts weren’t just responses to Hannah’s revelations and actions but rather more insightful as to who he is as a character. Regardless Thirteen Reasons Why is a compelling story about the how the actions of one can affect another. It’s a somewhat harsh but valuable lesson.